The history of the Sikhs during Mughal rule and particularly by the orders of Aurangzeb is full of stories of triumph and bravery in the face of unspeakable cruelty and torture. This is an excerpt from one of those stories; on the occasion of Nanak Jayanti and the martyrdom of Teg Bahadur, this seemed appropriate. 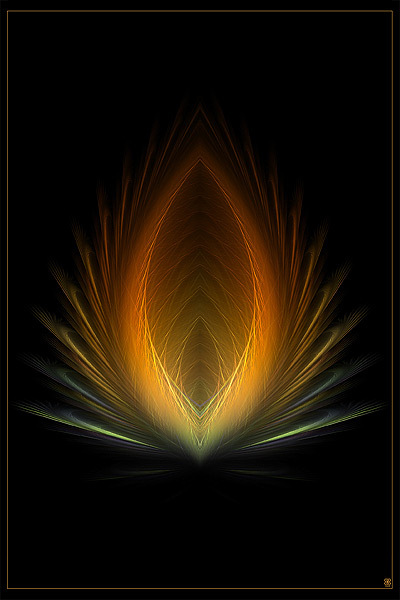 Just as nearby trees that feel the heat can go up in flames when one tree catches fire in a forest, when a great man is born among a group of people the whole nation is illumined by the flame of that great spirit; no one can stop its progress. The indomitable spirit that was Nanak’s did not die out with his death. The song of joy and hope that he sang resounded through the land. Teacher after teacher arose and led the Sikhs along the path to salvation. The tyrannical Muslim rulers of the time committed many atrocities but they could not halt the advance of the Sikh nation, inflamed as they were by the teachings of their young faith. Let me tell you the story of how the Sikhs became a race of brave warriors by passing through obstacles and hardship. Eight gurus or teachers had come out of the Punjab after Nanak; the ninth was Teg Bahadur. We are talking about the time when the cruel Aurangzeb was the emperor in Delhi. One of Teg Bahadur’s enemies Ram Rai, was a member of the Emperor’s court and it was he who filled the Emperor’s ears with falsehoods until Aurangzeb was incensed and sent for Teg. When Teg saw the Emperor’s men at his door he knew he was doomed. Before leaving he called for his son. This child of fourteen was named Govind. Teg tied the sword that had served his ancestors to Govind’s waist and said to him, ‘You are now the guru to all Sikhs. If the executioner should slay me by the order of the Emperor, see to it that my body is not left to the mercy of jackals and dogs. You will have to right this wrong, you will have to take revenge.’ He then went to Delhi. He was questioned over and over about his activities by the court. Some asked him, ‘Why do you not prove that you are a great leader by performing a miracle?’ Teg Bahadur said, ‘That is not my purpose. A man’s purpose is merely to seek God. But I can show you something unusual since you have asked. I will write an incantation on a piece of paper and place it on my neck and that will stop you from severing my head.’ He then placed the paper on his neck and bared his throat. When the executioner raised his sword and brought it down, his head rolled away. Someone picked up the paper and saw these words written there – ‘I gave up my head but not my beliefs.’ This was the manner in which Teg Bahadur found respite from the interrogation in the court. This entry was posted on November 25, 2015, in Rabindranath Tagore's stories, Uncategorized and tagged "শির দিয়া, সির নেহি দিয়া।', Guru Teg Bahadur, Nanak. On the train from Dover that morning were several people. There was the Colonel, retired and lately of Afghanistan and the widow Grimalkin. There were the Knickerbocker twins on their way to work in the city. There was Miss Motlop, a distressed gentlewoman who was the widow’s long suffering companion and woman Friday. Her rather extraordinary bosom had defied every attempt at being confined by the widow Grimalkin, and attracted the admiring eyes of every male in the compartment. The only men who were oblivious to her charms were a group of foreign gentlemen dressed in a curious blend of Eastern fashion and Savile Row style. Two were young men, handsome and straight backed in the way of a lot of the visitors from the East. They were probably in their early twenties, one a little shorter than the other. With them was a young woman who studied everything with a sort of delightful curiosity and wonder. She wore a saree and a buttoned long coat despite the English summer. The fourth member of their group was a tall man with patrician features, a flowing beard and white hair in a long robe. His eyes were mostly closed during the journey and in his arms he held a brown leather case. The young woman talked to him each time she saw something new. When one of the young men tried to rebuke her for this, she protested and went and sat next to him. The rest of the passengers watched them curiously, their eyes drawn to their elegant clothes and the aristocratic bearing of all four. The widow Grimalkin thought him quite attractive and sighed more ferociously than usual as she bemoaned the lack of unattached elderly men of substance in the village of St. Margaret’s Bay. The young Indian woman, for that is the country the foreigners were from, started at the sound and turned to her companion to say something about the changing landscape outside the window. The pristine Kent countryside in which they had begun their journey was now far to the south. In its place were the smokestacks and chimneys of London, the heart of the great machine that was the British Empire. The English passengers began to focus on their belongings and reticules. In due course the train pulled into London with a great puff of steam. At the station, the people descending from the train formed snakes of humanity that merged and separated from each other as one, parting when they came upon the Doric columns on the platform and porters pushing luggage carts and joining again as they passed them, eventually passing out of the gates of the station into the penumbra of that great hive of activity. By the time they had reached the outside, the passengers of the compartment were nearly invisible in the sea of hats, suits and umbrellas that made up most of the six thousand people that came into the city each day. For a brief moment Miss Motlop saw the Indians as she stepped to the edge of the pavement and hailed a horse drawn carriage. They were looking around them with some wonder as omnibuses and carriages rushed past. Then she and her mistress were both off towards Cheapside where they were to spend a week with her sister and she could see their foreign co-passengers no longer. The elderly gentleman looked at her and felt delight in her wonder. He had been to England in his youth but this visit was poignant for a different reason. He had wanted to show his wife the world outside the family home and estates. But she had been dead these past ten years. It was as though a part of him had died with her. He would not have come had it not been for his son’s insistence that he join them. He had received invitations from various luminaries such as Yeats and Rothenstein to visit England. But he was also glad that he came as he saw his daughter-in-law’s child-like wonder at everything that she saw for the first time. She had marvelled at the telephone in their rooms in Dover, picking it up to listen to the operator again and again. Then there was the gas heating in the rooms, one simply had to drop a coin and wait for the heat to turn on. She would have had them all eat ice cream for breakfast, lunch and dinner if they had agreed! Her wonder at each thing reminded him of the boy he had once been half a century earlier. He had planted a few seeds in a heap of dust that had escaped the notice of the household cleaners. He watered them carefully over weeks, watching as they unfurled their young shoots and leaves in defiance of their lowly birth. But one day all was lost when he returned home to find that the seedling forest had been removed and the corner swept clean diligently. How he had cried to see them gone. ‘Here comes the train, ready to eat us all up here and spit us out further along the track,’ said her husband. The elderly gentleman smiled to himself. His son had absorbed some of his wife’s delight at their new surroundings and was shedding his usual serious manner. He thought of a few lines, a poem about a chance meeting between two people on a train. As they waited he tried to focus on the words; his memory was as good as ever but he would need to write it down soon. Then the train rushed into the station and stopped. They got in once the crowd in front had cleared. Soon the guard announced that the doors were closing and the train started. The group sat down on the tartan seats and looked about them. Opposite sat a youth with a dreamy expression on his face and a small pocket book in his hands. He wrote a word every now and again in its pages with a stubby pencil and erased it almost immediately. Old eyes met young ones and an ancient shared understanding passed between the two. The next day a messenger was sent to the Railways Lost and Found Offices. In Hampstead everyone went about their day, each secretly hoping that the book would be found. Visitors dropped in. 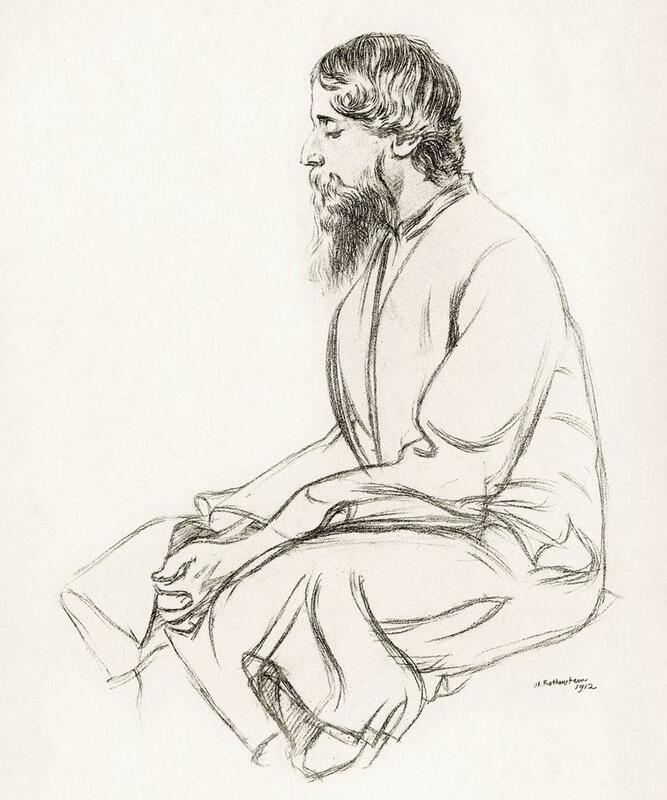 Among them was Ezra Pound who came for lunch and stayed the night, sitting on a chair by the Indian poet’s side and listening to him speak as a disciple might at the feet of a great prophet. There was little to indicate any inner turmoil on Tagore’s part. Towards the afternoon, the doorbell rang and Alice Rothenstein answered it thinking it was her favourite, the writer G.B. Shaw who had promised to come and meet Tagore. But it was the messenger who had been sent to find out about the book. This is where the story ends, at least that of the lost manuscript. Tagore was to win the Nobel Prize in Literature the following year for these very same translations; Song-Offerings as it was called although neither he nor his hosts knew this at the time. But this is not just Tagore’s story. Wilfred, the young man who had found the manuscript went away to France at the end of that year. When the Great War broke out in 1913, he stayed on in France as an English tutor. He was doing what later generations would call conscientious objection, decrying the violence of war. But even he could not stay away from it when he read the English newspapers his dear mother sent him, with their growing lists of war dead and description of the horror his people were going through. He joined the war in October 1915 and died a week before it ended on November 4th 1918. He was twenty five. After his death, his belongings were sent back to England to his mother in Shrewsbury. The war had ended by then. 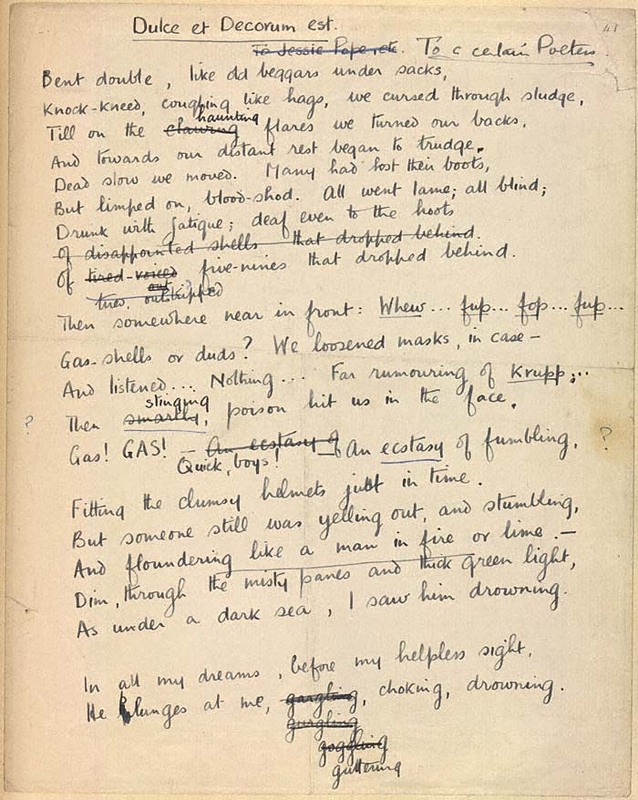 Among these was a pocket book inscribed with a few lines the young poet had read years ago in a handwritten manuscript on the London Underground. 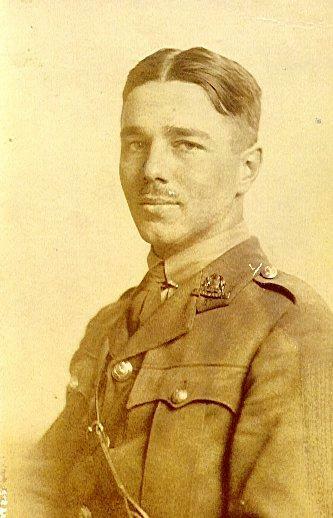 Wilfred Owen was arguably Britain’s best war poet. Sir Rabindranath Tagore as his mother Susan Owen addressed a letter that she wrote to Tagore in 1920 was certainly India’s finest. as part of their edition on The Other Tagore.